Dr. Jürgen Toft is one of Germany’s preeminent knee surgeons. He began his orthopaedic training in the early 1970s and eventually took over as the Consultant Orthopaedic Surgeon at Orthopaedic Department at Municipal Hospital in Ingolstadt. He is renowned as a pioneer in biosurgery of the knee joint, which emphasizes repair generated from the patient’s own body. In 1985, Dr. Toft founded the Alpha-Klinik for Knee and Spine Surgery in Munich. In addition to offering surgery to knee and spine candidates, the Alpha-Klinik also houses a respected research department. Dr. Toft has saved more than 4,000 knee joints in his career. Knee1: Your research into osteoarthritis differs from that of many other orthopaedists in that you favor cartilage regeneration over arthroscopy or knee replacement. Can you explain why? Dr. Toft: In the case of osteoarthritis, the cartilage wears down to bone, a condition that then hardens the bone. Much of the pain the patient feels originates from the bone in the later stages, as opposed to the earlier stages when the pain is caused by inflammation. The inflammation, in turn, is caused by the continuous rub-off of cartilage particles. Once there is nothing to be rubbed off anymore, what happens is that bone-on-bone contact with every step results in the remodeling of the bone. The bone hardens and becomes a little bit like marble, which squeezes the nerve ending inside the bone to cause another type of pain. Now, the patient is not really interested in where the pain originates—the fact is that once the articular cartilage is worn down to bone, there is sometimes a certain interval during which the patient doesn’t have much pain because the inflammation has stopped. After a year or two, once the bone has caught up with the hardening process, a new pain starts. This is generally the time when the patient is looking for some solution. The solution that is generally given to the patient is knee replacement or in some cases unicompartmental knee replacement. Replacement surgery is something that is okay for the older patient, but it is not okay for patients between 35 and 65 years of age. In this age group, generally what the patient hears from the orthopaedic surgeon is that the knee is bad enough to require replacement surgery, but the patient is too young for it. So then the patient resorts to physiotherapy, medication, inflammatory agents—and is told he has to wait until he reaches a certain age where the implantation of a total knee joint replacement is justifiable. This is where we have developed an alternative that restores articular cartilage not by replacing it with artificial substances like metal or polyethylene, but rather by stimulating the body’s own repair response. The repair response is elicited by removing a superficial one-millimeter of bone with a high-frequency burr. This procedure is called abrasion arthroplasty. This procedure causes the roughened bone, which is slightly bleeding after the procedure, to produce an outgrowth of repair tissue that is almost like cartilage—it is fibro-cartilage. 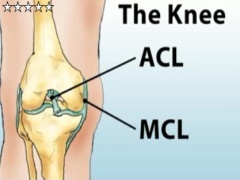 Knee1: What is the difference between this new cartilage and the original cartilage? Dr. Toft: The difference is in its composition. Hyaline cartilage contains well-organized collagen fibers whose fine architecture, combined with ground substance, gives it a water cushion-like effect. It is elastic, it has a good water binding capacity, it is very resistant to rub-off, so the original hyaline cartilage is the best you can think of in the knee. If nothing is left of all that and you are faced with a situation of bone-on-bone, the second best solution is fibro cartilage, which is different from hyaline cartilage in that it is less elastic, less cushioning, and less resistant to mechanical damage. Fibro cartilage is, in theory, good enough to stay in place for long periods of time and cushion the underlying bone especially if you address concomitant biomechanical problems. If you address these problems along with the regrowth procedures, abrasion arthroplasty, then this new repair tissue, which replaces the original articular cartilage, has a good chance to stay in place for about 12 to 15 years. Knee1: What is the rehabilitation time for a patient who undergoes abrasion arthroplasty? Dr. Toft: Rehabilitation time is relatively lengthy because the knee must be kept on a non-weight-bearing protocol for three months. Most doctors think this amount of time is impossible to sell to the patient, but it is absolutely mandatory that the patient stay on crutches for that length of time. During the rehabilitation period the patient also cannot exercise the muscles. Early weight bearing and early exercise will ruin the new tissue. On the other hand, if you think you can bring the patient back to playing tennis or another such sport, I think the procedure is absolutely worth the effort on the part of the patient. Knee1: What led you to focus on rebuilding cartilage as a means of treating arthritis? Dr. Toft: The fact that I was one of the first in Germany to introduce arthroscopic surgery as the primary means of dealing with knee problems brought me into contact with an American surgeon, Dr. Lenny Johnson of Lansing, Michigan. Dr. Johnson invented abrasion arthroplasty back in the late 1970s and early 1980s. It is from him that I took the procedure, modified it a bit, and extended the indications. For example, I never worried about the size of the lesion—whether it is 2 square centimeters or 12 or 15 square centimeters does not make a difference. The body will repair most damages, size notwithstanding. Also, I found that the age of the patient is not a limiting factor. The limiting factors are largely given by the technique you use during the operation, by the cooperation of the patient to stay on crutches for that length of time, and by the physiotherapist staying away from the patient’s knee for that period of time. If the patient goes along with the whole program—not just the abrasion arthroplasty but also the procedures around it that may be necessary, such as corrective osteotomy or ligament replacement—then the success rate is very good. Knee1: You call cartilage regeneration a cure for osteoarthritis. Can you tell me how many patients must have a total knee replacement despite having undergone abrasion arthroplasty? Dr. Toft: Less than 3 percent of patients move on to having total or unicompartmental arthroplasty over a period of 10 years. I think this is an acceptable figure especially if you consider that these patients on the basis of their X-rays and MRIs would have been candidates for total or unicompartmental knee replacement from the beginning anyway. If the patient does not go along with an indicated osteotomy, for example, the figure goes up to about 15 to 18 percent. Knee1: Is it difficult to be the doctor who disagrees with the conventional thinking on how to treat osteoarthritis? Dr. Toft: Yes, it is difficult because the procedure is not very widespread. Dr. Johnson unfortunately did not have very many followers because the technique is technically demanding. If you do not do it on a routine basis every day and you have not seen it with your own eyes, you may not believe in it. When you look at the literature, most of the reports on abrasion arthroplasty are negative. If you look at the numbers, though, they are very limited. You get the impression nobody really stayed with the procedure long enough to look at it from the top of the learning curve. In the beginning, maybe people were disappointed with the outcomes and prematurely left it by the wayside. I feel that this is unjust and unfair to the procedure because it can do much better than is written in the literature. Knee1: Is there something specific about the knee that lends it to abrasion arthroplasty, or do you think the procedure will eventually be applicable to other joints such as the shoulder? Dr. Toft: We can certainly apply the procedure to other joints because the general repair response that the body has is ubiquitous—you can find it anywhere in the body. The need for it may not be as widespread in other joints that are not weight-loaded as much as the knee is. Osteoarthritis in the shoulder for people who did not have any severe injuries is very rare. You do find osteoarthritis in the hip and even the spine. So the concept can be used anywhere there is a tissue that you want to grow on bone to either cushion the bone or stabilize some tissues that are on the bone. Knee1: Tell me a bit about the Alpha Klinik. Do your patients come to you specifically because they have heard of your cartilage regeneration procedure? Dr. Toft: Yes. One of the main groups we have here is comprised of the severely arthritic knee patient. They hear from other patients, may have seen something about it on television, read about in a magazine, or found information on the procedure on our Web site. The source of information is varied but the Internet is becoming more important in terms of spreading information. Knee1: In the last chapter of your book, Knee Arthritis, you focus on fitness and nutrition and their impact on osteoarthritis. How does diet affect the joints? Dr. Toft: There is some research out that says you should eat complex carbohydrates, carbohydrates with a high glycemic index, a lot of fiber, and not a lot of meat. The whole thing is based on enhancing the body’s metabolism. Some of the arthritic changes are probably due to deposits of particular substances that are not carried away in due time. In the osteoarthritic knee you may see calcium deposits and uric acid crystals. Inferring from that, you should make sure you take enough fluid, that you enhance your metabolism by eating the right food, and that you get enough vitamins and minerals. Knee1: I have heard a lot about glucosamine sulfate (GS) and its effects on joint healing. Do you recommend GS supplements at the Alpha Klinik? Dr. Toft: We do recommend GS supplements following the surgery, although we prefer hyaluronic acid preparations to be injected into the knees because we feel it is a more direct way of influencing the cartilage metabolism. Glucosamine has been very popular in Germany for many decades. It has been on the market here for maybe 30 years. Intra-articular injections with hyaluronic acid are probably a better choice. Knee1: What type of patients do you treat? Dr. Toft: Regarding abrasion arthroplasty and osteotomy as a combination program, the main thing to understand is that we are talking about a classical candidate for knee joint replacement. This is not just someone that would be a candidate for mosaicplasty or cartilage cell transplantation. This is a totally different league we’re playing in here. Mosaicplasty and cartilage cell transplantation are good for very small, circumscribed lesions. The people we are talking about here are years and decades beyond that stage. If you take their standing radiographs and their MRIs and send them out to 15 or 20 different university hospitals, 90 percent of the university orthopaedists would recommend total knee replacement. Some would say “wait and see” if the pain is not great. Some would recommend unicompartmental knee replacement. But it is highly improbable that you would receive the program I just described. This is important for the readers to understand: the procedure is for the severely destroyed arthritic knee. Even if it is unstable on top of it, even if it has a severe deformity, even if it looks hopeless, it is not hopeless. Something very sensible can be done about it. We bring people back to very active lifestyles with this program. Of course, it requires a lot of cooperation and belief on the part of the patient. If everything comes together, the result obtained is often wonderful.